I know Jupiter emits infrared light but does it emit any light able to support plant life of any type on near by Moons? 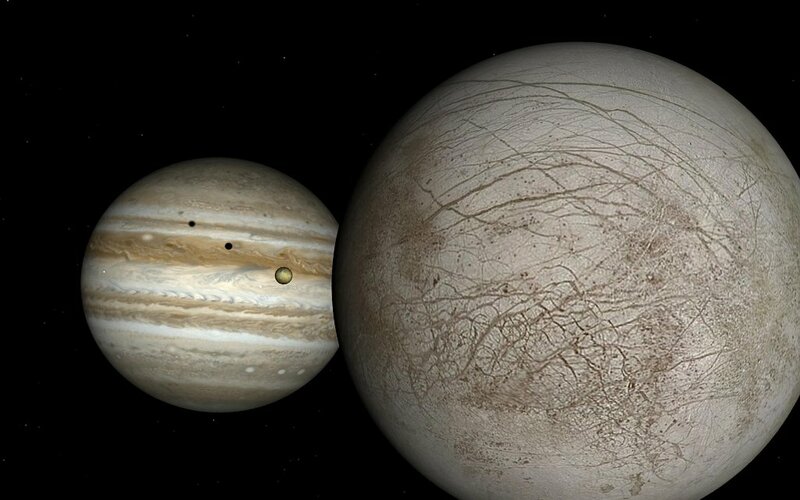 Can under water volcanic activity of Europa produce enough light to support plant life? The surface of Europa gets some sunlight direct from the sun and some long wave radiation from Jupiter so it's not in darkness. It's also in Jupiter's radiation belt so it gets hit with high energy charged particles and the surface of Europa, despite being bombarded by particles is still a vacuum. The surface of Europa is a terrible place to look for life, with the exception being that the liquid ocean of Europa explodes onto it's surface regularly, so evidence of life, if it exists, may well be found on the surface, but it's unlikely that anything can live there for long. It's very inhospitable. The inside of Europa is more interesting. That's why Neil deGrass Tyson says he wants to go "ice fishing on Europa" to see what "licks the camera" and if we find life there we'll "Call them Europeans" . . . funny comments aside, the inside of Europa is probably dark, outside of some infra-red rays due to temperature. Photosynthesis doesn't work well in darkness and with just long wave light, though maybe it's possible, it wouldn't nearly as much growth due to far lower energy levels. As noted in the answer to your other question, if there is life in Europa's ocean, it's more likely to be something like chemotrophs. What makes Europa interesting is the energy it gets from tidal forces being stretched between Jupiter and Ganymede, so it gets a regular influx of heat and perhaps internal volcanism, so it may have undersea vents similar to our oceans. The energy influx and possibility of underwater volcanoes makes it more interesting than most other moons or dwarf planets. If life is found in Europa's oceans, even if it's very primitive life by most standards, it would still be a very cool discovery because it could tell us something about how life starts and that's a big unknown right now. The discovery of life outside the Earth would be a very big story. We'll probably have to wait till 2030 before we begin to get some answers. Sorry for the long wait, but it is what it is. Not the answer you're looking for? Browse other questions tagged light jupiter natural-satellites life europa or ask your own question. What evidence is there of Earth-Like internal features of Europa? Can Doppler shift make colors of two stars at same distance different? What is needed to break through the surface of Europa? Is the Drake Equation an accurate way of finding the probability of life on planets? Is there a type of star that emits relatively monochromatic visible light?